Home › Fish tank aquarium › Freshwater aquariums. Aquarium is a very fragile micro environment. Following certain basic principles, setting up a new aquarium is easier than it looks at first glance. In an aquarium we may have to use freshwater or saltwater, depending upon the origin of the ornamental aquarium pet. If your water source is slightly saline, you need not worry. Several freshwater species of the ornamental fish can withstand brackish (low saline) water. However you should know which of the species that can tolerate brackish water. Another important factor having direct effect on the success of the aquarium is the water temperature. Ornamental aquatic pets originate from, tropical, subtropical or temperate zones. Providing the required temperature in the ornamental tank is vital for the survival of the aquatic pet. Many fishkeepers fail to understand the importance pH plays in the aquarium. Though most of the ornamental species tolerate the average range of pH, which can be buffered by adding crushed coral, some fish prefer low or high pH. A beginner may better avoid such types of pets. For a freshwater aquarium several groups of fishes are suitable. Some of them are: gar, sunfish, spiny eels, rainbowfish, pufferfish, knifefish, loaches, guppies, mollies, platies, swordtails, gouramis, paradisefish, bettas, killifish, gobies, darters, goldfish varieties, minnows, danios, rasboras, barbs, cichlids, angelfish, characins, tetras, catfish, corydoras and reedfish. Having decided whether to go in for freshwater or marine (saltwater) tank, now you need to decide between tropical or coldwater species. For a tropical tank, maintaining a warm water temperature is necessary. Small bodies of water lose heat much quickly in a cold room. For cold water animals, water temperature must be cool enough for it to thrive well. Tropical fish must be kept in a warm heated ornamental tank. Water temperature, maintained between 75 to 80 °F (24 to 27 °C), enables them to thrive well. A planted tank is ideal for the aquatic pets. They will get hiding places and select a cozy nook of its own. The selected plants must withstand warm waters. Some suitable invertebrates also may be added. Some of the ideal tropical ornamental fish are, cichlids, bettas, tetras, angelfish, loaches, guppies, barbs, mollies, platys and swordtails. Cold water species such as, common goldfish, fancy goldfish, koi and White Cloud Mountain minnows, can withstand room temperature in temperate zones and are quite comfortable at around 60°F (15°C). Apart from the typical cold water species, there are several subtropical species which can withstand cool waters. Some of them are paradisefish, rosy barb, pygmy sunfish, rainbow shiner etc. An experienced local pet shop owner will be able guide in the selection of the freshwater species, considering the climate you live in. Apart from the fish tank and its stand, several components and accessories are required. 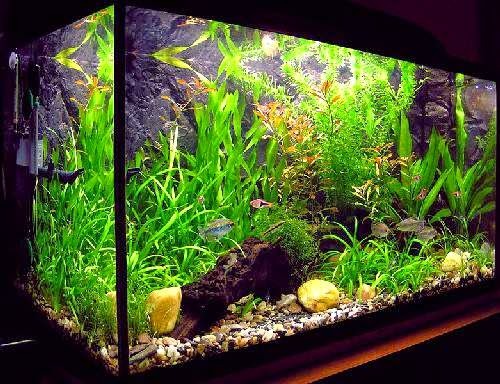 You may buy either a glass tank or acrylic tank. The size of the tank depends upon where you want to keep it and the available space. Tanks with anything less than 10 gallons (38 liter approx.) are not advisable. In smaller tanks it is harder to maintain temperature and good water quality. It is preferable to have a hood with lighting arrangement. A sturdy tank is necessary. Please note that one liter of water weighs one kilogram. So the stand must be strong enough to support the weight of the freshwater tank with water. It will be advantageous, if the stand has some concealed space for keeping aerator and other accessories. Depending upon the size of the tank you can go in for either an undergravel filter or power filter. Bigger aquarium requires power filter. The undergravel filter is not suitable when you have sand or other fine substrates. You may require two to three inches of substrate like sand or gravel. The substrate must be rinsed thoroughly to remove dust and waste matter. Some freshwater fish and invertebrates have the habit of burrowing and require sand. You may go in for live plants or plastic ones for your aquarium. Choose the appropriate decorations, keeping in mind the type of freshwater fish you are going to have in your tank. Basic aquarium maintenance practices include tank cycling, acclimatizing, feeding, cleaning, temperature maintenance, water quality testing, aeration, water changes and checking the animals for signs of stress and disease. Types of freshwater aquarium fish. Current topic in freshwater tank: Freshwater aquariums. Click on the box to get volume; round off to nearest gallon.